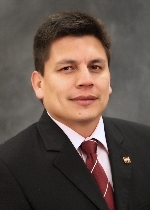 John J. Ramirez-Avila is an Agricultural Engineer holding a Master’s degree in Soil Sciences and a Doctoratal degree in Civil and Environmental Engineering with emphasis in Water Resources Engineering. John is an Assistant Research Professor in the Civil and Environmental Engineering Department at MSU performing investigation designed to test, validate and improve analytic tools for the prediction of nutrient loads from watersheds, with a particular focus on the Mississippi Delta. He also pursues research focused on the determination of sediment sources and development of a regional sediment management plan, and on streambank erosion and sediment transport monitoring and modeling at reach and watershed scales. His past work experience involves research in the evaluation, enhancement, and conservation of environmental and water quality and nutrient management. He was engaged in studies pertaining to the assessment of soil erosion and nutrient losses at plot, field and watershed scale. He also participated in the development, evaluation and implementation of BMPs and management plans to reduce non-point pollution of surface waters, and in the evaluation of the costs imposed by water pollution and soil degradation. Soil and water quality, soil and water management and conservation, soil erosion, nutrient transport from soils and watersheds, nutrient management, streambank erosion, suspended sediment transport, channel evolution, channel and watershed modeling.